Artist Series classical guitars are beautifully made using a traditional Spanish heel construction. Their thoughtful bracing helps deliver sustain, balance and volume. 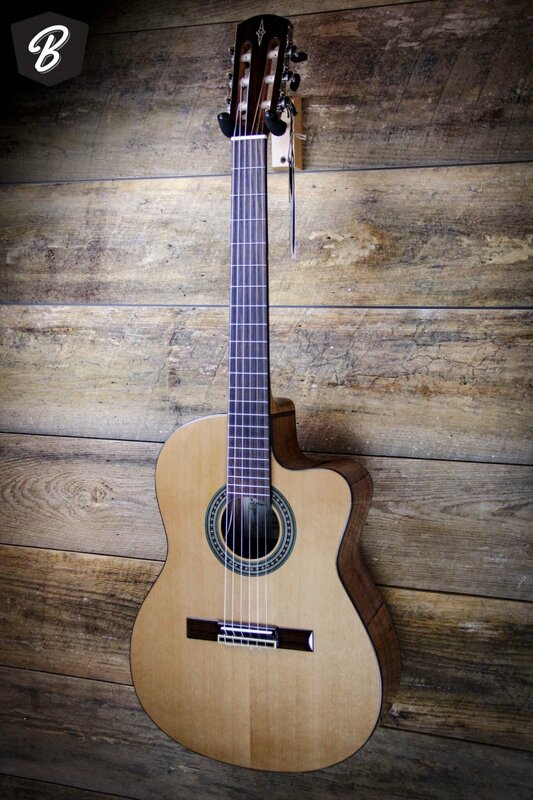 This Hybrid version AC65HCE is a classical guitar with a narrower nut (48mm) and therefore thinner neck. The fingerboard is also arched with a radius similar to that of steel string guitars. So really, it's a nylon string guitar that sounds like a classical but plays like steel string. It's also fitted with wonderful wonderful L.R. Baggs StagePro Element electronics with its undersaddle pickup and a sidemounted preamp that not only gives you a 3-band EQ, but adds a Garret Null notch filter, phase inversion and a full chromatic tuner. The Alvarez Artist Series AC65HCE Classical Hybrid Acoustic-Electric Guitar is a member of the Alvarez Artist '60 Series. Alvarez was careful to get the construction just right to allow this series to sing, and deliver a player experience that's exceptional for a mid price instrument. The solid 'A' grade cedar tops are hand selected from quarter-sawn wood. This ensures consistent quality, and its no secret better guitars are made from better wood. These tops not only look great but they are stiff and strong and finely grained. This allows them to be cut just that tiny bit thinner, which lets them dance a little more and produce a lot more vibration, and ultimately a richer tone.